Weddings are a big deal for a lot of reasons. They mark the beginning of a new marriage and life together, and often it’s the only time that all your extended family is in one place. So naturally, making sure you have amazing photos of your wedding is super important. It’s also super important to make sure those amazing photos will be ones that you love for many years to come. Yes, it’s hard to know what you might love in 5, 10, or 50 years, but there are a couple of things to be on the look out for when selecting your photographer that will help ensure those photos stand the test of time over the course of your life. First, the content of the photography should be timeless. What does that mean? It means the core of the photographs are steadfast … the images should full of the people you love and emotions that are genuine. 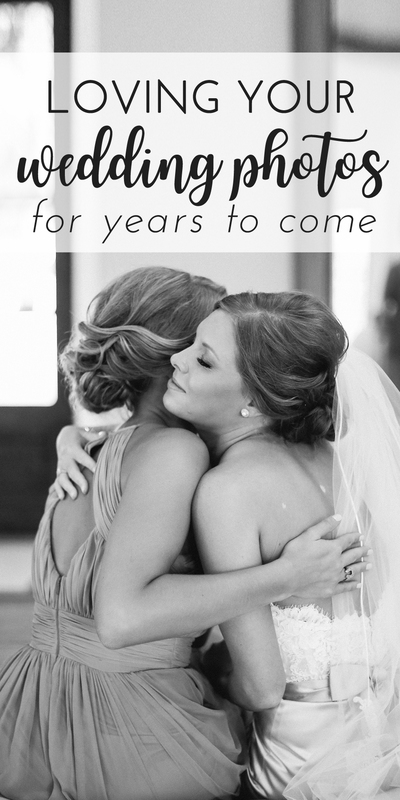 Even as the years march on and wedding styles change, your love for your spouse, family, and the emotions you felt will continue to ring true. Chances are, this means the images will not be strange or stiff poses or simply “cool” shots replicating something on Pinterest, but rather faces of newlyweds loved ones photographed simply without much distraction. Second, the editing style should be void of trends. Do you remember selective coloring? It’s where an entire image is turned black and white, save for one detail, such as the bouquet, which remains in full color. That editing technique was all the rage about a decade ago, but now it’s considered cheesy and blasé. To avoid your photos falling into a trendy trap, look for a photographer who’s editing style is clean, consistent, and true to life. Avoid a photographer that relies heavily on editing with filters or who’s posing might look cool now but be considered odd in years to come. For an example of timeless photography, take a look at my website. I always strive to make sure my clients’ images are beautiful and ready to stand the test of time. Head here for more tips on how to find a wedding photographer.